The Movement Against Xenophobia is a network of organisations, groups and individuals working to oppose anti-immigrant agendas in the UK. JCWI (the Joint Council for the Welfare of Immigrants) contacted us to develop a high profile website, to support their ongoing immigration poster campaign which aims to highlite the contributions made by immigrants across the U.K whilst allow them to tell their own individual stories. 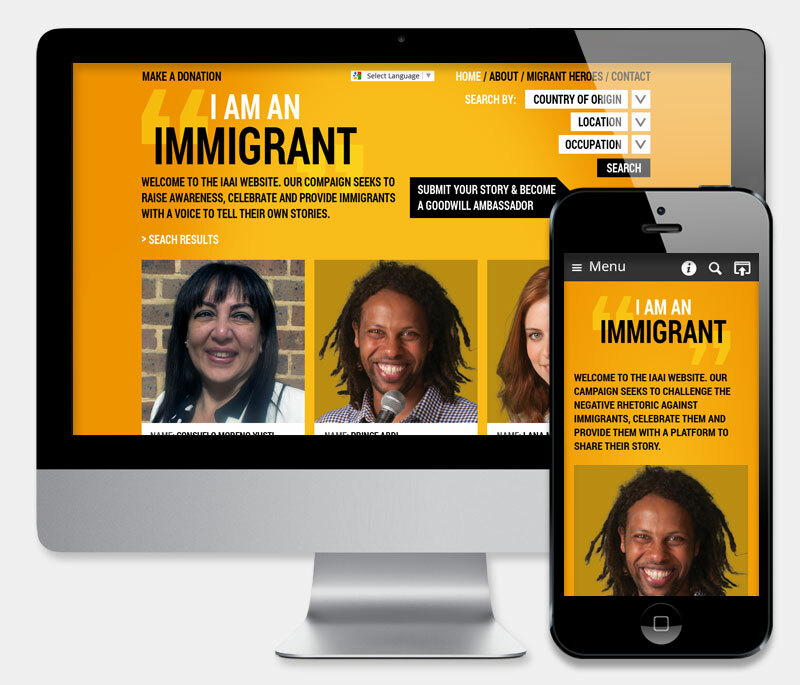 We built the I am an Immigrant website on the open source Drupal framework using crontibuted modules and custom development. One of the challenges we faced was the poster search, which had to include different parameters in the same request, using the powerful Apache Solr search. Another hightlight is the poster form that allows non-registered users to submit their own story and submit and crop their supplied images. Editors are then able to easily moderate the content and publish the appropiate stories via the admin panel. We asked the team for a quote for our new campaign that was launched before the General Election, entitled “I am an Immigrant”. This was a nationwide poster campaign but we wanted a website to go alongside the launch of the campaign. The timescale was very tight with only two full working weeks before the launch. Website Development were excellent, they worked with us on all steps and produced a fantastic website ready for the launch. Dee is extremely approachable and fully understood our brief and the ethos of the campaign which was replicated on the website they developed. The team helped us with all questions big and small and went the extra mile in ensuring the website worked smoothly allowing people to create their own posters, well after the development was complete. We would have no hesitation in recommending Website Development for a professional, cost effective and empathetic service.